We are in receipt of a letter from Viola Lawton, Area Supervisor of District No. 1, in Spokane, requesting that we furnish your office with data on Aplets, as a food product peculiar to our state. Not knowing just what type of data you desire makes it rather difficult for us to determine just what to give you in this letter. 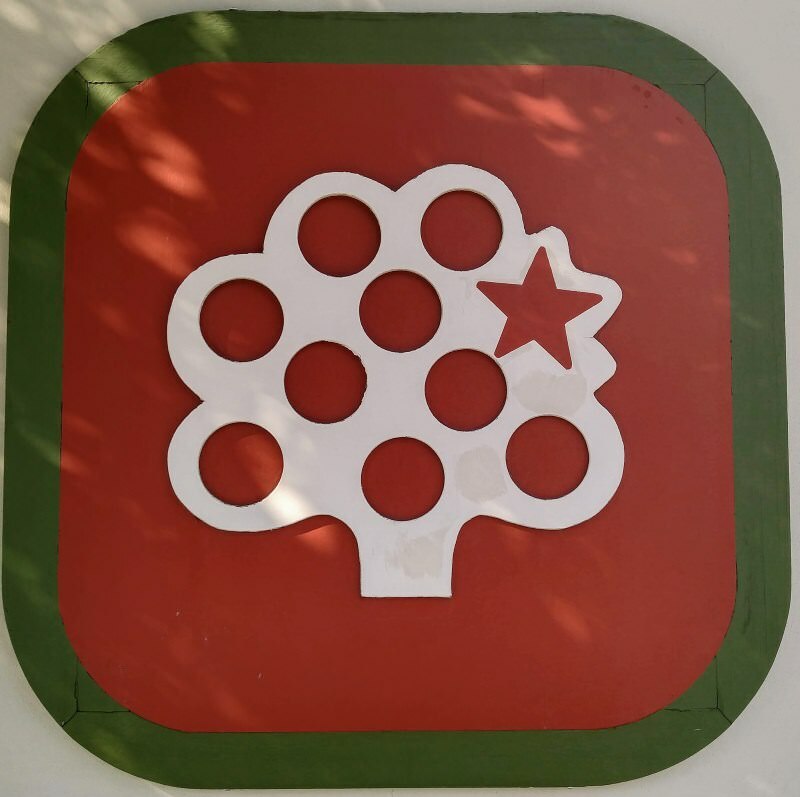 Aplets were first put on the market in late 1919 and early 1920 by two naturalized citizens of Armenian parentage, Mr. M. S. Balaban and Mr. A. L. Tertsagia, brothers-in-law, who for a few years previous to that time had been putting out evaporated apples in a small plant located in Cashmere, Washington. When the new confection caught the public fancy, this evaporating business was discontinued and the factory given over to the manufacture of the candy alone In 1923, a larger and more convenient factory was built adjoining the old frame building in which the industry was started. This new factory was damaged by fire in 1928, and rebuilt after the fire, with an office addition built on at that time. 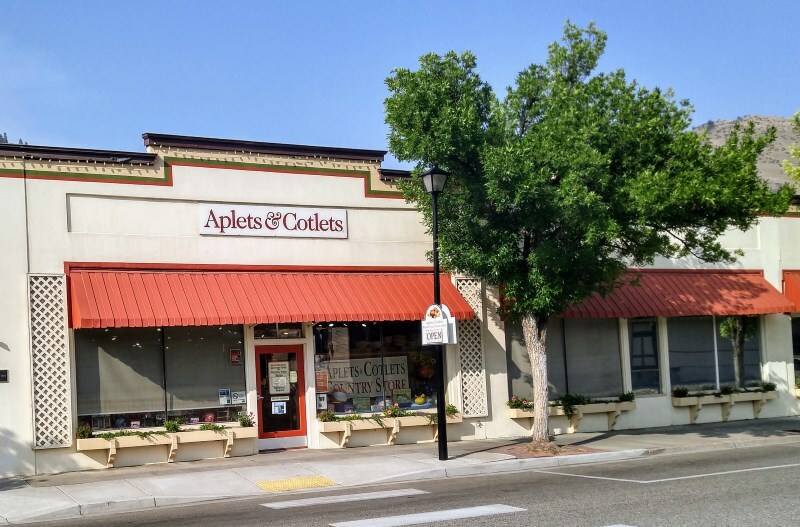 Aplets were based on apple juice extracted from the lower grades of the fruit grown so abundantly in the Wenatchee Valley, sugar, the finest of California and Oregon walnut meats, and other ingredients of correspondingly high grade. In 1923, another fruit-nut confection, called Cotlets, because it contains sun-dried apricots, and apricot pulp, was added to the line, and is also becoming the most popular with the buying public. Both products meet the highest quality demanded by the Pure Food and Drug Act, and are healthful, satisfying sweets for all ages and classes. "The Unique Fruit-Nut Confections of the Golden West"
I first read this passage on a sunny July morning this last summer; just by chance, my discovery of these lokum-like confections happened just as my youngest son - who was traveling with my mother and sister to visit the Oregon Coast in order to see the ocean for the first time in his life - was passing through the area where Liberty Orchards is based and these treats are produced. Interestingly, Cashmere, Washington lies right along US Highway 2 - a road that I know well, snice I grew up alongside it and live a stone's throw from it even now in Chinook, Montana. It doesn't seem right to call these "candies," so I will call them "confections," "treats" or "little cubes of wonder" instead. 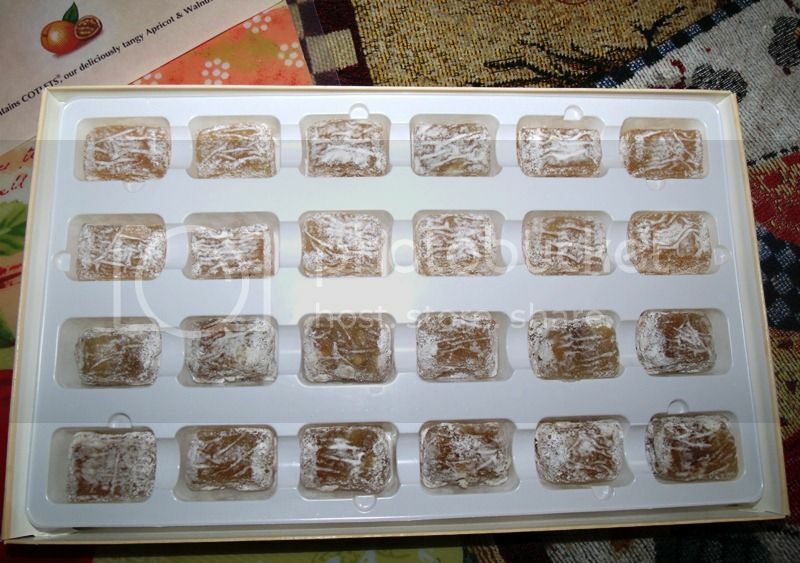 They are very closely related to lokum - also called "Turkish delights" - of the Middle East; however, they have a distinct Pacific-Northwest identity to them in that they are made from apples and apricots that are lovingly grown in the famous orchards along the Wenatchee River, which wends its way through Cashmere. But no! Their crazy father (husband, in case of the Beautiful Mrs. Tas) had to keep taking all of these cursed pictures! For each photo you see here, Dear Reader, there are about six discarded ones, after trying different angles, lighting etc. It was a bit time-consuming; and now, just as everyone could barely keep themselves from reaching in to grab these new, mysterious, oh-so-tempting arrivals from Washington, this shutter-happy fool of a father has to actually cut one of each open and arrange the pieces on a saucer in order to show the far-flung members of his precious forum what they look like inside! Now you know what I went through to get these few photos, my friends - I cannot imagine the guards at the gate of Vienna having a more difficult time holding back the eastern hordes; you could cut the exasperation that was in the air with the dullest of knives! Simply put, they were delicious! 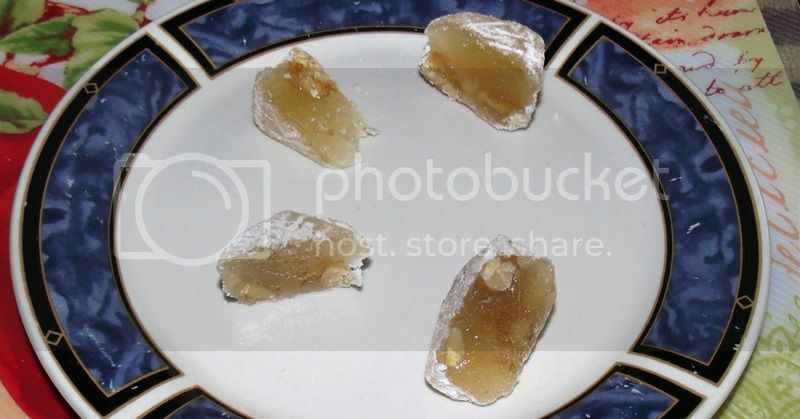 I don't have much of a sweet tooth, but I do truly enjoy things like this a lot - the jellied texture, the sweet/tart fruit.... I don't know why I love them, but I do, and these were perhaps some of the best yet. Maybe it was because of the history behind them, the regional pride and tradition - or maybe it was simply because they were just that good. Each variety had its own distinct taste - the apricot-based cotlets perhaps just a bit more intense than the aplets - and I was impressed with the way that both the texture and the flavour were heightened due to the contrasting walnut pieces - truly delightful, and sure to be treasured. I hoarded the few remaining ones in the freezer, so that they could maintain their freshness. 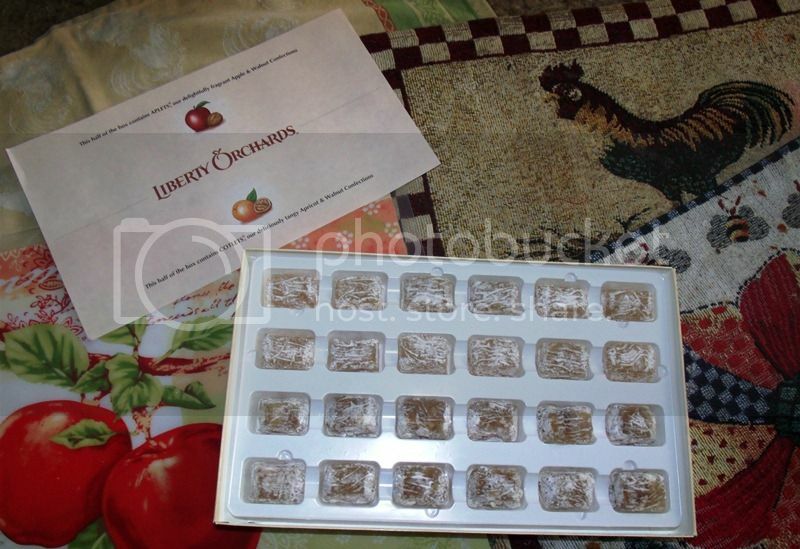 Throughout the remainder of the summer, I would split one with one of my sons, or with the Beautiful Mrs. Tas, and take a nice little trip back to the orchards where these confections originated. 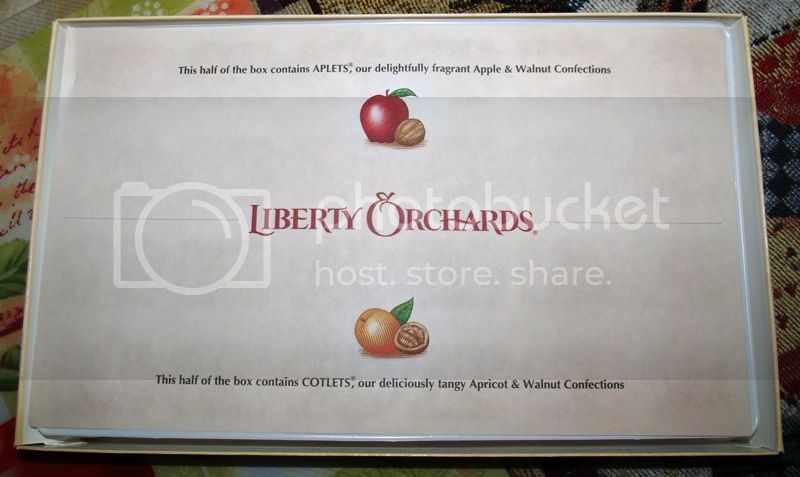 Strongly recommended, the orginal aplets and cotlets are available by contacting Liberty Orchards, or they can be purchased through Amazon.com and other on-line resources. Please do give them a try, as you won't be disappointed. While I'm at it, I'd also like to suggest that you consider reading Kurlansky's book, The Food of a Younger Land, available through Amazon.com. 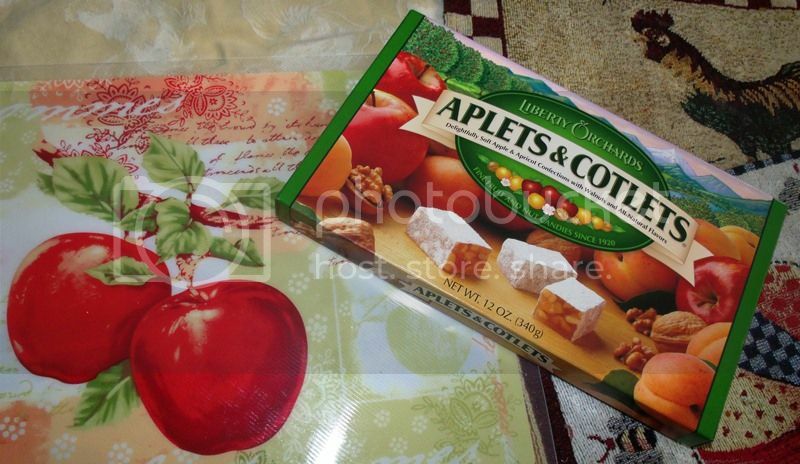 I've loved aplet's and cotlet's since I was a kid. Maybe growing up in this region where they're in just about every supermarket helps. Interestingly enough, one of my favorite places, Leavenworth WA (a delightful little Bavarian Alps themed village in the foothills of the cascades [http://www.leavenworth.org/]) is about 10 minutes from Cashmere and the Liberty Orchards factory. I've been to Leavenworth lots of times but have yet to make it over to Cashmere for the factory tour. I'll be up there next month for a little weekend getaway, so maybe I'll have to take the tour and expand on your thread a little. That would be awesome, Mike - I look forward to it! 90+ years making the same high-quality product. There's a lesson in that the fast-food and convenience product guys could learn! Love applets and cottlets. Cashmere is just a couple of hours away and have been on the tour several times. You used to be able to buy bags of factory seconds. Don't know if you still can. They have other flavors now. pineapple strawberry etc. I still prefer the original though. The Beautiful Mrs. Tas and I are going on a trip next week through northwestern Montana and onward to Wenatchee, Washington; Cashmere is not much farther west, so I "intend" to make an excursion to there in order to see Liberty Orchards and, of course, pick a supply of goodies. Have a great trip! I suggest if you're going as far as Cashmere, go the extra 15 minutes or so to Leavenworth as well. You will not be disapointed, especially given your German heritage! If nothing else, The Cheesemonger's Shop and Cured are worth the trip by themselves. That sounds like a good idea, and I'll see if we can add it to the schedule; those sound like great places to visit. Thanks for tipping me off on that! go the extra 15 minutes or so to Leavenworth as well. You will not be disapointed, especially given your German heritage! Ummm...yeah. After a little bit of googling, I think it is safe to say that I will be there, as well! I was able to visit Leavenworth, and found it to be the most charming town on our entire vacation. Mike, thanks for the recommendation! I may or may not have found it on my own, but it was really cool to look up the information on it, and I was filled with great anticipation about seeing it. I was not disappointed! Next time we are there, we will definitely be taking some extra funds with us, so that I can properly enjoy the experience and bring a few treats home. Beautiful area! We also visited the home of Aplets and Coplets in Cashmere - it was great! 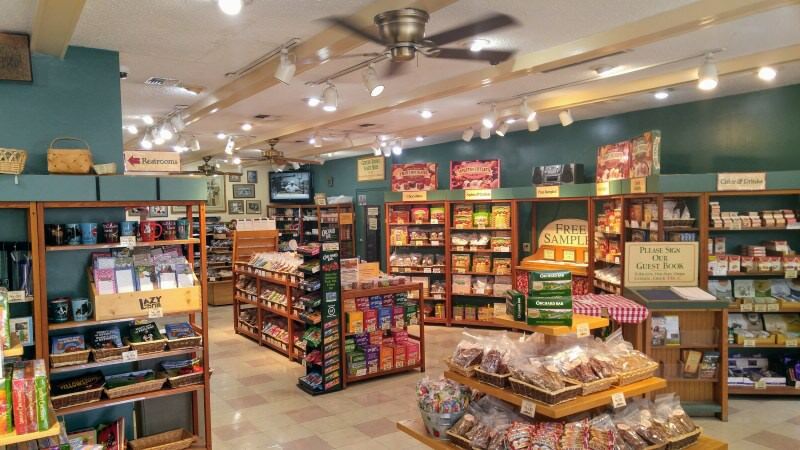 We arrived just minutes before closing; however, the staff there was very gracious and helpful, staying open late, showing us around, offering samples, and answering questions. This too was one of the highlights of the trip, for sure. There is a lot of pride and tradition there, in the middle of such beautiful orchard country. The family and I were impressed, and we plan to visit again...not just Cashmere and Leavenworth, but that entire section of the state, with such a bounty of fresh fruits and vegetables. And Brook - keep an eye out in your mail! Awesome Ron, glad you made it in time for the tour. It's definitely on my list of things to do next time I'm in that area.